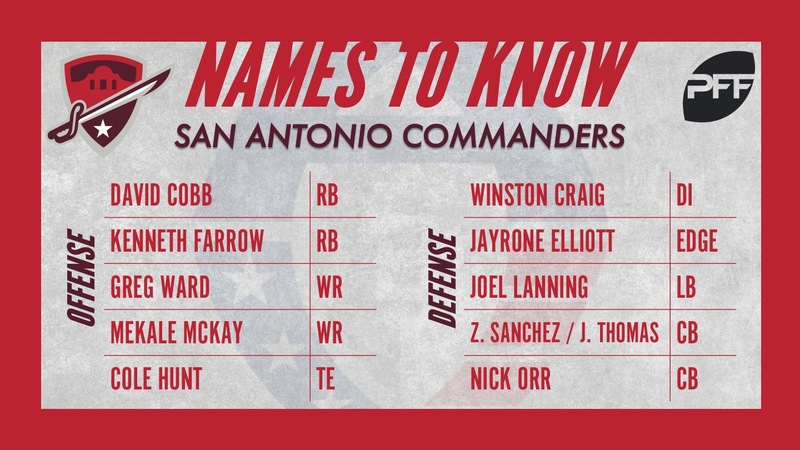 We continue the list today with the San Antonio Commanders, head coached by Mike Riley. Cobb is a power-back, through and through. He may not burn many guys with his speed but he did rack up 100 of his 146 yards with the Tennessee Titans in 2015 after contact. Prior to that, Cobb was tremendous in 2014 during his final season with the University of Minnesota. He racked up 1,625 rushing yards, forced 56 missed tackles and averaged 3.10 yards after contact per attempt. He hasn’t latched on to a team since 2016 but his experience both in the NFL and with Minnesota combined with his bruising style of running make him a threat to score in the red zone on any carry. The Commanders have elected to field four running backs on their roster and Farrow brings with him NFL experience from his time in the regular season with the Chargers in 2016. He totaled 60 carries that season, gaining 192 yards and moving the chains on 10 attempts. His style of play is similar to that of Cobbs as he also dominated during his time in college so it will be interesting to see how San Antonio uses the power duo as well as Aaron Green and Trey Williams in the backfield. You remember Greg Ward. Right? The former University of Houston wide-receiver-turned-quarterback who only just turned back to a wide receiver in 2017 in training camp with the Philadelphia Eagles. Ward brings a big-play ability with him as his quicks and knowledge of the San Antonio passing game should only play to his advantage at receiver. He’s as talented as they come and the bag of tricks that the Commanders could pull out with him at receiver are seemingly endless. He gained a whopping 2,650 rushing yards during his time at Houston, 1,336 of which came after contact as he forced 89 missed tackles on his 303 career carries. The former Cincinnati Bearcat has two years of college grades in our system as well as two preseasons of action during his time with the Indianapolis Colts in 2016 and Dallas Cowboys in 2017. He’s a big-framed receiver at 6-foot-5, something he used to his advantage back in 2015 with UC, hauling in 19 first-down receptions and two touchdowns on just 26 total catches. With the speedy Ward and a couple other playmakers occupying defensive backs, McKay, put in the right system, could dominate on contested catches. Hunt bounced around the state of Texas during his time in college, heading from Rice to TCU where he played under head coach Gary Patterson. He never really caught on as an aerial threat, hauling in just 25 receptions from 2014-2017 with both programs but he did put forth plus-grades in pass protection while at TCU. In the right system, with his hand in the dirt, he could benefit while also adding a quality blocker inline as a tight end and as a run blocker from anywhere along the formation. All you had to do to spot Craig’s impact was throw on the first set of preseason tape from the Commanders in 2019. Craig spent just 15 snaps on the field but finished with an astounding 96.1 overall grade against Atlanta. He rushed the passer 10 times, got home with a sack and a hurry while also recording another defensive stop on his lone other tackle. While we have limited data from his time at Richmond in our system, he still did show up against big-time opponents when we graded the Spiders. He’s a mobile asset to the San Antonio defensive interior. Having played 363 regular season NFL snaps, Elliott is a name that’s pretty well known. His career year with the Green Bay Packers came in 2015 when he recorded 10 total QB pressures on just 89 pass-rushes, including three sacks and three QB hits. He also brings with him another 341 snaps from preseason camps with the Packers and the New Orleans Saints from as recent as last summer. He’s shown he can produce against the best the NFL has to offer and he’s still fresh having spent time with New Orleans in August. We won’t talk about Lanning’s time spent as the Iowa State quarterback, we won’t. We won’t. We really won’t. Lanning moved on from quarterback (oops!) in 2017 when he was told he wouldn’t be the starter anymore during the 2017 season. Rather than seek out a transfer, he stuck around and decided he would play where he could best help the Cyclones. Although he would be called back into duty, the fan (and team) favorite took to his new position well and put forth strong grades as a pass-rusher and despite missing his fair share of tackles, was a sharp sideline-to-sideline tackler. He recorded 21 total QB pressures on just 69 pass-rushes and he also completed 211-of-374 career passes for 2,575 yards and 20 touchdowns. Okay, fine, I mentioned his time when he played quarterback. The former Sooners duo is too difficult to separate here. Without a full depth chart released, how could you break up the former Oklahoma pair. They each have a unique skill set they bring as they both possess the height and speed necessary to make all the plays at cornerback. Another former Big 12 secondary member making the list, Orr’s family pedigree would have been enough to make people pay attention, but he’s more than deserving of his spot on this list from his own play. Orr headed to the Chicago Bears as an undrafted free agent after playing 3,018 snaps from 2014-2017 with TCU. He never graded lower than 69.0 and increased his overall grade in every season. In 2017 alone, he allowed less than 50% of the targeted passes thrown his way to be caught (46.3% to be exact) and limited quarterbacks to a 58.0 passer rating when targeted. The QB Battle to watch: Former Toledo QB Logan Woodside impressed during his tenure with the Rockets while Dustin Vaughan has spent quite a bit of time in the NFL. Which QB will carry the Commanders for the majority of the regular season will be fun to watch all season.